Rough stones measure between 0.5" - 0.9". 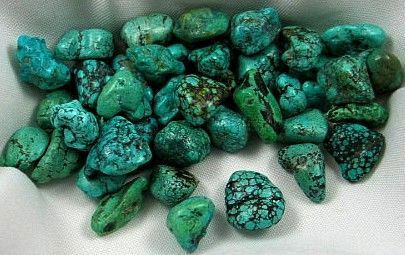 Turquoise is a copper rich stone that has been used in jewelry and decoration for centuries. It is quite soft, with only a hardness of 5 to 6, so it is good to treat these stones gently. Turquoise is usually stabilized with a clear coating to help prevent them from crumbling. Unfortunately turquoise is often imitated by dying other stones to mimic turquoise. The beautiful shades of blue are caused by copper content while shades of green are caused by iron. Turquoise has been considered as a gift from the earth, bringing the blue of Fathers Sky with the energies of the heavens to the Earth, melding with the consciousness of the Mother Earth. It aligns and strengthens all chakras, and can bring any and all energies to a higher plane, although it primarily stimulates the throat, heart and naval chakras. This stimulates communications skills, creativity, and intuition to emotional problems. It has been said that turquoise changes color to warn of impending danger or to indicate infidelity in thought or action. Turquoise has also been used during deep meditations for grounding. It is a stone of soothing energy.